The beginning of the 21st century gives us the opportunity to celebrate, among other things, the diverse traditions that have been a part of the history of our faith. The labyrinth is an archetype, a divine imprint, found in religious traditions in various forms all over the world as far back as 4000 years ago. The design of the labyrinth is based on principles of, what Keith Critchlow from Magdalen College in Oxford calls, sacred geometry, with everything in proportion and balance to itself, a pattern found over and over again both in nature and in art throughout the centuries. Christians in the Middle Ages often made a vow that, in their lifetimes, they would make a pilgrimage to Jerusalem. But the Crusades, along with other conflicts in Europe and Palestine, made that dangerous and expensive. The labyrinth became a central symbol of pilgrimage throughout this time. The church encouraged pilgrims to travel to one of seven European cathedrals, where they could walk a labyrinth, reach its center – symbolically, the new Jerusalem – and by this journey fulfill their desire as Christians to retrace their sacred history. The most commonly known labyrinth is the only one of the seven medieval labyrinths that survives to this day: the labyrinth in the floor of Chartres Cathedral in France. The winding path of the classical labyrinth imbedded in the floor of Chartres Cathedral extends about one third of a mile in eleven circles, and takes about twenty minutes to walk at a leisurely and prayerful pace. Although at first appearance it looks like a maze, a labyrinth is not a maze. Where a maze is meant to confuse and present obstacles, a labyrinth, usually in the form of a circle, has a purposeful path, moves from the outer edge of the circle, and follows a pattern of winding turns, bringing the walker to the center, and then back out again. A maze often has many paths, and causes disorientation. The labyrinth has only one path, and is a symbol of our journey through life. The path is circular, the universal symbol for wholeness and oneness. Because of its universal nature, the labyrinth offers a form of meditation to people of all faiths, cultures and traditions. 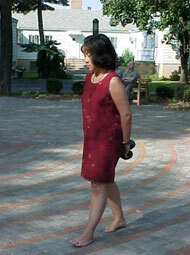 Walking the labyrinth is a form of prayer that engages our whole person. When walking the sacred path, we are invited to let go of the books and words and experts on whom we so often depend for answers to life’s deepest questions, and to trust the wisdom that is within. As we enter the path, a container of our unique journey, we bring all that we are to the Center, to God. “There is but one road which reaches God, and that is prayer. The experience of walking the Labyrinth can be seen as paralleling the three stages of prayer found in classical spiritual writers like Teresa of Avila and John of the Cross. The path to the center is the path of quieting ourselves inside and out; of letting go of the details, distractions and busyness of our lives; of moving away fr om the ordinary routine of daily life; of surrendering control and dependence on our usual ways of knowing; of purification, healing, and forgiveness. It is the path of PURGATION! The center is the place for waiting, listening, and open attentiveness to the Divine Presence within; discernment, insight and illumination; receiving a Word, a gift, or the grace we are seeking; quiet resting in God. The center is the place of ILLUMINATION! 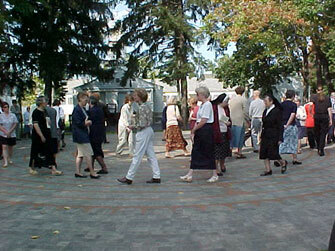 The path from the center is the path of returning to life with new understanding; of walking at-one-with-God, to live life in deeper intimacy with God than before; of going forth to give as a gift what one has received as a gift; of continuing one’s journey with greater wholeness and integrity. It is a path of UNION! Begin with a few moments to quiet your body, heart and mind. Be aware of where you are on your personal journey at this time in your life, and what it is you bring to this time of walking prayer. Be aware of God’s presence with you, and invite the Spirit to be your guide. Please walk with soft clean shoes, socks, or bare feet. Quietly approach the entrance to the path. Pause there and, when you are ready, begin your walk. Enter the labyrinth as long as it is not crowded. Listen to your breathing, and set your own pace. Allow yourself to move as spontaneously as possible. Trust your own rhythm, and listen to your body’s desire to dance, skip, run, walk very slowly, or stop along the way. Let the experience unfold without expectation. Pass others if you feel a need to move at a faster pace, and allow others to do the same. You will walk the same path both ways, so you will meet others along the way. Simply step aside if you meet someone going the opposite direction, let them pass, and continue your walk. When you come to the center, remain there quietly for as long as you need to — waiting, listening, open, attentive — present to the Divine Presence within you. When you are ready, return by walking the path back out, carrying in your heart what you have received. Scripture reminds us that what we receive as a gift we are to give as a gift. You can deepen and integrate your walking prayer into your life by taking time afterward to reflect on your experience. Journaling your experience – draw, paint, write a poem! Sharing your experience with someone you trust. Letting what the path has taught you transform the way you live your life.